I didn’t win this weekend’s race. I’ll just let that one sink in as it’s no doubt come as a bit of a shock. The course was pretty dry and, I decided after watching the Vets and women fly round, damned fast. A few cheeky ‘power’ climbs with loose surfaces a corner-y section followed by a flat out flat bit round some rugby pitches. Good fun. 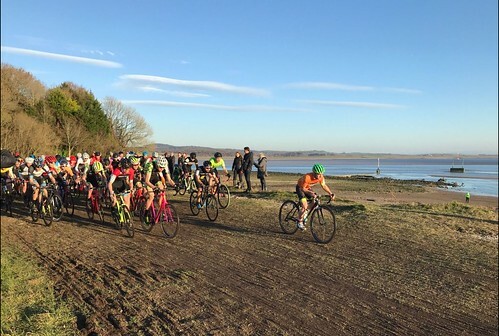 You even got to have a look across the estuary at the start of each lap (briefly) to remind yourself that you were having fun on bikes at the seaside. I got my usual awful start, concentrating far too much on getting clipped in cleanly and getting swamped by faster starters. I fought back through the pack, having a bit of a battle with Rob from Macclesfield Wheelers, before briefly getting back up to Giles and Tom from Wheelbase, who were busy racing each other. Annoyingly/typically, I made a few mistakes which let a gap reopen to them, so I eventually crossed the finish line nearly 20 seconds back from them, in 5th place. Drat. Thing is, though, it kind of felt like I was in the lead, simply because of the support I was getting from all the way round the 1.3 mile course. I was getting so many cheers / shouts of encouragement / feedback on how I was doing / mild sarcasm / professions of love (not from Angela, I noticed…) I started to feel a bit guilty that I wasn’t streaking away from the rest of the racers like some sort of international superstar. I know it’s fun to cheer people on – half the fun of race day is watching the other races and hurling encouragement / mild abuse from the pits/sides of the course (in fact it’s well worth going to a race even if you’re not taking part in the ‘riding a bike’ part of the day, just to cheer people up by shouting at them! ), but it made such a difference to me, I ended up grinning from ear to ear by the final lap. Ace. Thank you. Another National Trophy next weekend (provided my poorly van is fixed in time…). Not at the beach, which will feel odd!